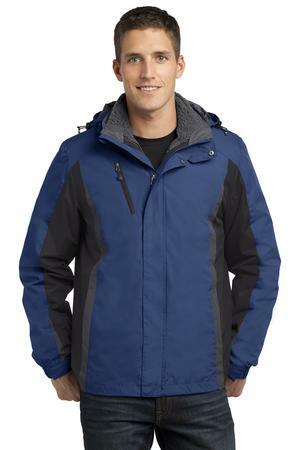 The Port Authority Colorblock 3-in-1 Jacket Style J321 is available in Men’s sizes XS – 4XL and comes the following colors: Black/Black/Magnet Grey, Admiral Blue/Black/Magnet Grey, Black/Magnet Grey/Signal Red and Magnet Grey/Black/Charge Green. The waterproof rating refers to the amount of water a garment can withstand in 24 hours before it leaks. In this case, this jacket can take on 3000 millimeters of water (almost 10 feet of rain or snow in 24 hours) before it leaks. Be the first to review “Port Authority Colorblock 3-in-1 Jacket Style J321” Click here to cancel reply.